Hyaluronan is the general term designating the linear repeating disaccharide, (beta-Dglucuronyl-beta-D-N-acetyl-glucosamine) of very high molecular mass (upwards of 106 Daltons). The term "hyaluronic acid" was adopted when the biopolymer was first isolated from the vitreous of bovine eyes in 1934. However, under physiological conditions, hyaluronan is not present in the acid form, therefore this term is redundant. The term "sodium hyaluronate" mostly designates the highly purified, narrow molecular weight range hyaluronan used as a therapeutic agent. These different terms specify only the natural, non-chemically modified biopolymer which is present in most of the body tissues. Hyaluronan is nearly ubiquitous in its distribution being present in the interstitial spaces of most animal tissues. Its principal role is as a structural element but functions may differ depending on its location in the body. Protect tissue against overuse and shocks by its viscoelastic properties. Only one kind of hyaluronan exists. The hyaluronan basic disaccharide (monomer) is composed D-glucuronic acid and Nacetylglucosamine, which are linked together through alternating beta-1,4 and beta1,3 glycosidic bonds. Hyaluronan is a large, polyanionic and linear polymer (glycosaminoglycan) of the repeating disaccharide structure. Each monomer presents axial non-polar hydrogen atoms and equatorial more polar side chains, thus creating relatively hydrophobic and hydrophilic faces respectively. Because the monomers are linked by alternating beta1,4 and beta-1,3 bonds, each monomer presents inverted hydrophobic and hydrophilic faces compared to the next monomer in the chain. The result of this particular arrangement is the creation of a twisting ribbon structure. This is the primary structure of hyaluronan. Given that the polymer presents, at the same time, hydrophobic and hydrophilic properties, it is expected that intra- and intermolecular interactions will occur when the molecule is placed in a solvent (secondary and tertiary structures). In solution, the polymer is stiffened by a combination of the chemical structure of the disaccharide, internal hydrogen bonds, and interactions with the solvent (hydrophilic patches). Consequently, the hyaluronan molecule assumes an expanded random coil structure in solutions (principally in water) which occupies a very large domain. Hyaluronan also presents hydrophobic patches that can have far-reaching implications for molecules in a watery environment. Hydrophobic parts of the molecule clump together in water, thus reducing their interface with the solvent. It contributes to structural stability in solution, although no chemical bond is formed. Hydrophilic and hydrophobic patches will give the molecule its secondary structure. The domain structure of hyaluronan has interesting and important consequences. Small molecules such as water, electrolytes and nutrients can freely diffuse through the solvent within the domain. However, large molecules such as proteins will be partially excluded from the domain because of their hydrodynamic sizes in solution. Hyaluronan also aggregates with itself and forms meshworks even at low concentrations (1mg/ml), partly helped by bonding between the hydrophobic patches (tertiary structure). High molecular mass hyaluronan meshworks at this concentration show no molecular ends or tails. The meshworks are essentially infinite. Every hyaluronan molecule is connected with all the rest, via the meshwork. On the contrary, although lower molecular mass hyaluronan forms meshworks at low concentrations, these meshworks are islands, separated from each other. The interactions which hold meshworks together are fairly weak, so that aggregates form and dissociate, depending on conditions and temperatures. Due to its particular molecular structure and its capacity to hold large amounts of water when in aqueous solution, hyaluronan presents, at the same time, characteristics of solids and liquids. Liquids or solutions presenting viscosity and elasticity at the same time, known as viscoelastic solutions, are unusual. Aqueous hyaluronan solutions presents non-Newtonian behaviour and are viscoelastic. This is a property of some solids. When a compressive force is applied to the solid, it absorbs the energy and deforms. When the compressive force is released, the solid recovers its original shape releasing at the same time the energy accumulated. Most of joints in the human skeleton are synovial joints. These joints present different degrees of mobility but are structurally similar. Synovial fluid which fills the joint cavity. Joint functionality is strictly dependent on the particular environment of the synovial joint. Hyaluronan plays an important role in the maintenance of this environment. Hyaluronan plays an important role in the synovial joints. It is found in the cartilage matrix where it provides rigidity and elasticity to the cartilage enabling it to absorb shocks. It is also an important component of the synovial fluid and provides the fluid with its characteristic viscoelastic properties. This fluid fills the entire joint cavity covering all the tissues and allowing a smooth and fluid movement of the articular surfaces. It also provides shock-absorbing properties, acts as a barrier to inflammatory cells and other catabolic substances such as cytokines and free radicals and masks pain receptors, thereby reducing pain. Together, these will create the joint homeostasis necessary for good joint function. The space lined by the synovial membrane is filled with a viscous fluid called the synovial fluid, which can be regarded as a modified extra-cellular fluid. Like other extra-cellular fluids, the SF acts as a transport medium supplying the articular cartilage with nutrients and oxygen and carrying away the waste products of metabolism. The main component of the SF is hyaluronan. The SF contains a complex solution of proteins, electrolytes, uric acid and glucose, in concentrations similar to blood plasma. The healthy SF contains approximately 0.2-0.4% of "non aggregated" hyaluronan with a mean molecular weight (m.w.) of 4-5 million Daltons(Da). Hyaluronan is constantly produced by the synoviocytes present in the synovial membrane and then extruded in the synovial space. There is a strict balance between its production and degradation. The SF has principally protective functions in the joint, acting as a lubricant, shock absorber and 'filter', and plays a key role in the maintenance of joint homeostasis. An important point of hyaluronan is that the meshworks it forms are ordered. The shapes of the hyaluronan secondary structures determine the shapes of the aggregates, and each branch in the meshwork carries with it two intrinsic directions, up or down, established by the hyaluronan chains. Hyaluronan solutions, and as such the synovial fluid, are viscoelastic. This means that the solution presents viscous and elastic characteristics at the same time. The viscosity is important providing lubrication when the solution is subjected to gradual shear stress. Hyaluronan solutions present non-Newtonian behaviour. This means that the viscosity decreases when the shear stress increases thus increasing lubrication. Example: the synovial fluid lubricates the joint when walking. The elasticity is important when a sudden loading force is applied to hyaluronan solutions. In that case, hyaluronan chains first absorb the loading force and then release it in a proper manner (shock absorbing properties). Example: absorption of shocks between boneheads when running. Due to its properties in solution hyaluronan forms meshworks that restrict the free movement of cells and large molecules through the joint, acting as a sort of filter. In fact the hyaluronan meshwork forms 'pores' which allow the free passage of small molecules, such as nutrients, but effectively block the passage of larger molecules, such as inflammatory cells or proteins. The hyaluronan chains are constantly moving in the solution, and the effective "pores" in the network continuously change in size. Statistically, all sizes of pores can exist, but with different probabilities. This means that in principle, all molecules can pass through a hyaluronan network, but with different degrees of retardation depending on their hydrodynamic volumes. This is very important as the hyaluronan in the synovial fluid can help to modulate the inflammatory response. Hyaluronan is produced and released in the synovial cavity by the synoviocytes. The hyaluronan contained in the SF also helps to form a coating layer over the entire inner surface of the joint. This layer is formed mainly from hyaluronan, in association with proteins, and is approximately 2µm thick. It plays several important roles in the protection of the articular cartilage including lubrication and a 'barrier function'. The hyaluronan layer is constantly degraded and renewed. The SF constantly supplies the hyaluronan layer with new molecules. In the healthy joint, this constant process is very important in the maintenance of joint homeostasis. Hyaluronan is produced by the type-ß (fibroblast-like) cells of the synovium and is secreted into the synovial fluid. The extracellular matrix contains a dense network of fine collagen fibrils which is responsible for the form and tensile properties of the tissue and hyaluronan aggregates formed by the spontaneous interaction between hyaluronan and proteoglycans. Hyaluronan aggregates draw water into the tissue by osmosis and exerts a swelling pressure on the collagen network. 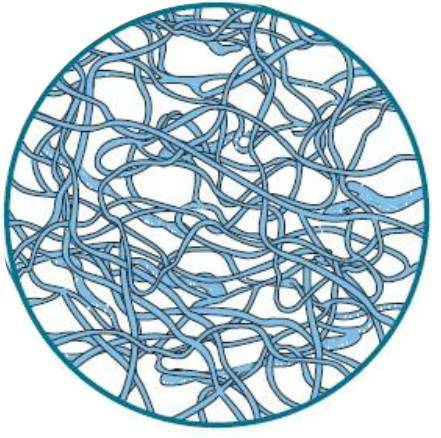 It is the retention of hyaluronan aggregates in compressed form within the inextensible collagen network that causes the swelling pressure and makes the tissue ideal for resisting compressive load with minimal deformation, thereby supporting its function as a tough and resilient load-bearing surface. The articular cartilage is also covered by the protective hyaluronan coating. This hyaluronan barrier protects cartilage from inflammatory mediators as well as degrading enzymes (proteases).